Welcome to the Q2 2017 newsletter! Zurich instruments' long-standing commitment to serving the SPM community hit a new milestone with Scienta Omicron's integration of the Zurich Instruments MFLI technology into their new Matrix 4 SPM controller. The MFLI is also integrated into Anasys Instruments' nanoIR2-s, a combined s-SNOM and AFM-IR instrument, as well as facilitating their patented Tapping AFM-IR™ technology. Read the interviews with Scienta Omicron's Martin Rohmer and Anasys Instruments' Craig Prater and Dean Dawson below on their experience of working with us. For those who would like to use the MFLI to build or extend their own SPM, Romain, our application scientist, explains how to put tip protection and fast auto-approach into place. We also have articles by Mehdi and Tim, also application scientists at Zurich Instruments, on proper noise analysis when using polar coordinates and impedance measurements at impressive 1 TΩ. More application know-how is offered in the short summary of key performance indicators for low-temperature physics lock-in amplifiers. Finally, check out our latest video about the first AWG to include detection capabilities. Get 1'500 Swiss Francs for your next conference travel! If you are looking for help with funding travel expenses for your next conference, the Student Travel Grant 2017 is still open for applications. Apply now! We wish you a splendid summer with many inspiring measurement results. 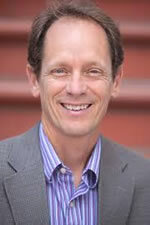 Martin Rohmer is leading the SPM business section at Scienta Omicron. 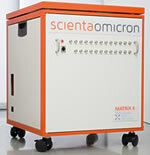 Scienta Omicron's new Matrix 4 SPM controller with AFM PLL powered by Zurich Instruments. 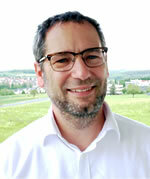 Hello Martin, Scienta Omicron launched 4 new products recently at the DPG meeting in Dresden. Please tell us, what's new? First, we launched the third generation of our low-temperature STM which now offers extremely low drift and highest stability for ideal performance below 5 K. The spectroscopy resolution is also much-improved and we have included QPlus AFM. Second is the new Fermi DryCoolTM SPM with infinite measurement time and convenient cooling between 10 K and 400 K, without the use of cryogenic liquid. 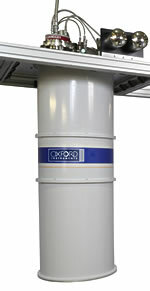 The users can perform QPlus AFM and STM with the Fermi DryCoolTM. The third new SPM is the TESLA JT SPM, a Joule-Thompson cooled low-temperature microscope for advanced imaging and spectroscopy below T = 1.4 K. STM and QPlus AFM measurements can be carried out in magnetic fields up to BZ = 3 T.
In addition, we launched the new Matrix 4 SPM Controller that contains an AFM PLL powered by Zurich Instruments. At which point in time did you start to consider integrating Zurich Instruments technology instead of doing your own development? The advent of the MFLI lock-in amplifier about 2 years ago coincided with the time when we were looking for a new QPlus solution. We quickly realized the potential to achieve our goal with considerably less effort. The spectacular noise performance and frequency range of up to 5 MHz provided a much better fit to our requirements than your previous high-frequency products. Also, the analog and digital interfacing capabilities were key considerations from the beginning. Combining the best digital signal processing with the best QPlus microscopes makes a perfect match for our customers. At Zurich Instruments we have designed the MFLI to be ready for integration as a subsystem: we have no physical buttons on the instrument, we added plenty of DIOs and provide a rich API. How did these features help you to create a compelling SPM controller? First of all, using the 4 Auxiliary Outputs for analog interfacing means that the MFLI can be integrated into a setup within a couple of minutes. That allowed us to do a lot of initial testing regarding performance and using it for different application modes. We quickly found out that most of our application modes are supported if the MF-MD Multi-Demodulator Option and the MF-PID Quad PID/PLL Option are installed. However, from this proof of principle to full integration we still had a long way to go. The most important step was the software integration, in particular fetching the measurement data directly in the digital domain and achieving full measurement automation with our well established SPM Control. With the current release, you can set up the oscillation of probes on a running SPM experiment using an integral routine to find the resonance frequency and set overall parameters that provide the best trade-off for highly sensitive and reliable measurements. Advanced users can tailor every step of the process and have full access to all control parameters. To ensure that tips are protected from unwanted crashes we integrated special extra fast communication between the Zurich Instruments hardware and our Matrix hardware which drives the microscope.This fast and reliable tip protection minimizes the risk of unwanted modification or destruction of the probe. During such a project, numerous challenges arise that can only be tackled by a tight collaboration between the two companies. The work with Zurich Instruments was highly productive and a great experience for us, both on the technical and business side. How will your existing customers benefit from the recent SPM controller developments? We have a strong commitment to providing our customers with software and hardware updates over long product life cycles. At the moment, we are evaluating for which Matrix hardware versions an upgrade is technically feasible. What I can say today is that all Matrix versions delivered in the last two years are upgradable. Did you receive your first feedback from the market regarding the new Matrix 4 SPM controller? The first reactions at the launch event at the DPG meeting were very encouraging. We are also proud to say that first Matrix 4 SPM controllers will soon be delivered to a third generation LT STM as well to a Fermi DryCoolTM customer. We are convinced that these combinations are the best possible solution in the market today. Thanks for your insights. We are very excited about the collaboration and look forward to seeing many groundbreaking publications based on the new Matrix 4 SPM controllers out there soon. Hello Craig, could you tell us how Anasys Instruments started and how it's developed over the past few years? Anasys Instruments was founded in 2005 with the vision of providing instrumentation for the characterization of material properties at the nanoscale. Our first products were based on nanoscale thermal analysis, i.e. measuring thermal properties of materials with nanometer level spatial resolution. In subsequent years, we pioneered new techniques for performing chemical analysis at the nanoscale with a novel combination of atomic force microscopy and infrared spectroscopy. We have also developed techniques and instruments that provide nanoscale mechanical spectroscopy and nanoscale optical measurements. Together these capabilities provide the ability to perform extensive correlative measurements of sample morphology, chemical, optical mechanical and thermal properties. You first encountered Zurich Instruments back in 2011 and started using our lock-ins a couple of years later. What were the features that made you choose, initially, the HF2LI and how did they help with the development of your technology and products? I first encountered Zurich products shortly after purchasing a legacy lock-in from another company. I was immediately filled with buyer's remorse [laughs] because it was clear that the Zurich Instruments lock-in could do so much more than the legacy lock-ins I was familiar with. I was especially taken by how flexible the Zurich Instruments products were. I loved that I could easily reconfigure the lock-in to perform different measurements based on my needs. We used Zurich Instruments lock-ins extensively in our development and prototyping to test new ideas. When you made the decision to incorporate the MFLI into the nanoIR2-s, one of the key issues was the integration of the instrument into your own software. How do you think this went and how would you assess the support that you had from Zurich Instruments during the process? We love the Zurich Instruments software interface. Anasys Instruments has completely integrated the Zurich core functionality into our own software so that our users can select any lock-in data channel whether it's to perform imaging, spectroscopy, etc. Zurich Instruments has been superb in providing integration support and training when we needed help. We have worked with many, many third party software interfaces and we have found LabOne to be the one we like the best. It is powerful, flexible, stable and very well supported. 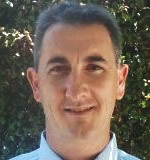 Dean, how is the Tapping AFM-IR™ capability being received in the marketplace? Our nanoIR™ technology breaks the optical diffraction limit with its patent pending photothermal AFM-IR technique and has already seen strong adoption with academic researchers and industrial users. Anasys' new Tapping AFM-IR™ has enabled us to dramatically improve the capabilities for nanoscale IR spectroscopy achieving, for the first time, 10nm spatial resolution for chemical imaging. The new mode also enables nanoIR™ products to be used on a broader range of materials and opens up many new applications areas such as adhesives, rubber compounds and many other soft matter materials. We have seen a surge of interest from researchers and industrial users interested in this new level of chemical imaging resolution. Part of the appeal of the AFM-IR technology is that it can be added to your instruments that are already out there in the field. That very much matches Zurich Instruments' approach to offering products that can be adapted to a user's ongoing needs. We have already delivered Tapping AFM-IR™ to a number of our existing customers. Using the Zurich Instruments products has enabled a modular approach to upgradeability and for the upgrade to be undertaken quickly and easily in the field. Updating our customer installed Zurich Instruments modules in the field was also fast and easy. This has resulted in our customers quickly adopting the new capabilities to help support new scientific research or, for our industrial customers, solve more sophisticated problems. So what can we expect from Anasys Instruments in the rest of 2017 and going into next year? We continue to launch exciting new product capabilities for our nanoIR™ spectroscopy products that extend our performance leadership, measurement speed, imaging resolution and broadband spectroscopy. We are excited to have Zurich Instruments as our partner in this endeavor. Thanks for speaking to us. We look forward to working together on your future developments. Speeding up processing and increasing uptime are key requirements for the successful use of Atomic Force Microscopy (AFM), in both scientific and non-academic environments. Romain Stomp's latest blog post helps all MFLI users to implement AFM Tip Protection and Fast Auto-Approach enabled by the new Threshold Unit included with every instrument. It provides one safety mechanism as the tip moves towards the surface and another one protecting the tip during active scanning. As a result, measurements can be set up with more confidence, more quickly and your work will not be delayed by replacing broken tips broken by unexpectedly rough or contaminated surfaces. In our latest video, Niels Haandbaek, development engineer, gives a short and crisp introduction to the Zurich Instruments UHFAWG, the first commercial AWG to include full-fledged signal analysis capabilities: Lock-in detection/Demodulation, Scope/Digitizer, Spectrum Analyzer and Pulse Counters. In combination with the LabOne instrument control software, you can perform measurements far beyond earlier AWG generations. Watch to find out more. Thanks to the MFIA's high sensitivity and eight current input ranges, it is straightforward to measure the impedance of 1 Teraohm components over a wide frequency range. Tim's latest blog post describes the impedance measurement of a commercially available 1 TΩ resistor over the full MFIA frequency range from 1 mHz to 5 MHz. The nominal resistor value of 1 TΩ is only valid up to about 2 Hz, before the capacitive effects set in. This demonstration shows the importance of characterizing components as a function of frequency before designing them into a circuit. The absolute impedance was measured to be 0.997 TΩ, which compares well with nominal value of 1 TΩ and tolerance of 10%. This shows the high accuracy of the MFIA, even at the edges of the accuracy chart. C. Riek, P. Sulzer, M. Seeger, A. Moskalenko, G. Burkard, D. Seletskiy, and A. Leitenstorfer, "Subcycle quantum electrodynamics" in Nature Letters, Vol. 541, Issue 7637 (2017). N. Mojarad, J.-N. Tisserant, H. Beyer, H. Dong, P. Reissner, Y. Fedoryshyn, and A. Stemmer, "Monitoring the transformation of aliphatic and fullerene molecules by high-energy electrons using surface-enhanced Raman spectroscopy" in Nanotechnology, Vol. 28, Issue 16 (2017). S. Link, D. Maas, D. Waldburger, and U. Keller, "Dual-comb spectroscopy of water vapor with a free-running semiconductor disk laser" in Science, online ahead of print May 11, 2017. Interpreting the noise data from lock-in amplifier measurements involves the understanding of the underlying statistical models. Whether you are looking at the in-phase and quadrature components, the amplitude or the phase you need to match the correct statistical distribution functions to the data. Check out Mehdi Alem's latest blog post that provides a short introduction to the subtleties of statistical methods for polar coordinates, helping you to quickly reach the right conclusion for your own data. Are you a PhD student and author or co-author of a paper or PhD thesis that mentions one of Zurich Instruments' products? Then don't miss the deadline for applying for 1 of 3 travel grants of 1'500 Swiss Francs each! The extended submission deadline is June 30, 2017. Detailed Application Know-How: What Makes a Good Lock-in Amplifier for Low-temperature Physics? Triton Cryofree® dilution refrigerator system from Oxford Instruments, used in world-leading research across condensed matter physics, with a particular focus on advanced computing, quantum technologies, spintronics and optics. Low temperatures (LT) are required for studying fundamental physics such as superconductivity, magnetism and low-dimensional quantum systems. The LT environment is usually hard to achieve, fragile and hence, poses a distinct set of requirements towards the used measurement equipment. Until recently analog lock-in amplifiers were the instruments of choice for LT measurements. However, the use of modern digital electronic components and appropriate design has made it possible for digital lock-in amplifiers to exceed the performance of analog lock-ins in all relevant aspects. Digital units are less sensitive to drifts, have better filters and, if well engineered, don't radiate spurs into the spectrum. 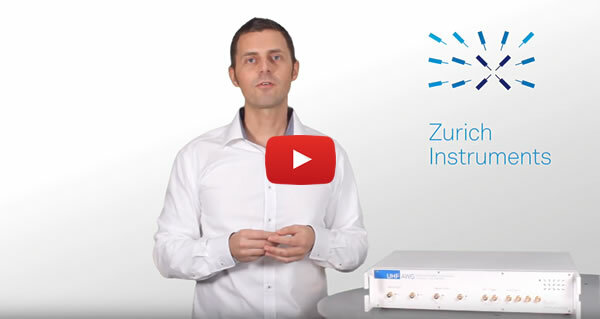 In today's market there are several vendors offering digital lock-in amplifiers, so what makes the Zurich Instruments MFLI, a 500 kHz / 5 MHz Lock-in Amplifier, the instrument of choice for LT measurements? An input noise floor that can be as low as 2.5 nV/√Hz with a corner frequency at about 10 Hz enables the best measurement sensitivity especially at low frequencies where most transport measurements are done. To avoid the increase of electronic temperature, the MFLI inputs are designed to have a low power dissipation of only -72.3 dBm in the range from 20 Hz to 180 MHz. Read our Technical Note "Power Dissipation at Input Connectors of Lock-in Amplifiers" for the measurement results. A high dynamic reserve of 120 dB preserves the specified accuracy, even in the presence of strong interferences that require the measurement to be made with a large input range. The MFLI can be battery powered to remove the power line components in the measurement setup. The LabOne user interface tools such as Scope, Plotter, Spectrum Analyzer and Parameter Sweeper are available for fast and efficient data capture without the need for extra programming and instrumentation. The functionality of the MFLI can be extended with numerous options, even after the initial purchase and without returning the instrument. The MF-MD option increases the number of dual-phase demodulators from one to four. This permits simultaneous current and voltage measurements, multi-frequency and/or higher harmonic operation. In some instances, dedicated DC sources for device gating and I/V measurements can be replaced by using the MFLI's 18 bit auxiliary outputs. In addition, an analog offset can be added to the voltage output without the need for external components. What is your opinion about it? Let us know your thoughts and we will be happy to discuss further.